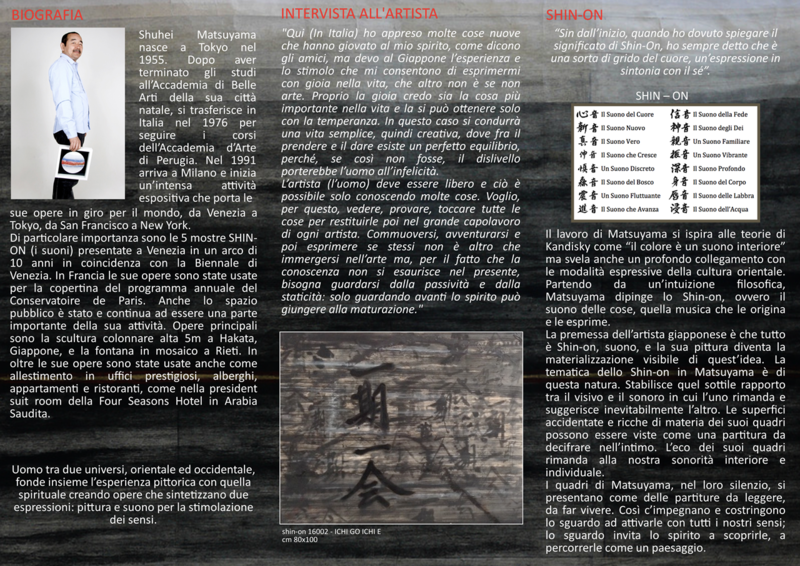 Mostra "ARTE, CULTURA E MARZIALITÀ"
DAL 5 AL 10 DICEMBRE L'ARTISTA SHUHEI MATSUYAMA ESPONE LE SUE OPERE ALLA SALA DELLE FESTE DEL MUSEO DEL TESSILE ( 10.00-12.00 / 16.30 - 19.00). IL 7 DICEMBRE, ALLE ORE 18.00, NELLA CORNICE DELLA SUA MOSTRA ALLA SALA DELLE FESTE, L'ARTISTA INCONTRERA' IL PUBBLICO PRESENTANDO LA FILOSOFIA ISPIRATRICE DELLE SUE OPERE , "SHIN-ON", OVVERO "DIPINGERE I SUONI", NEL CONTESTO DELLA TRADIZIONE GIAPPONESE. 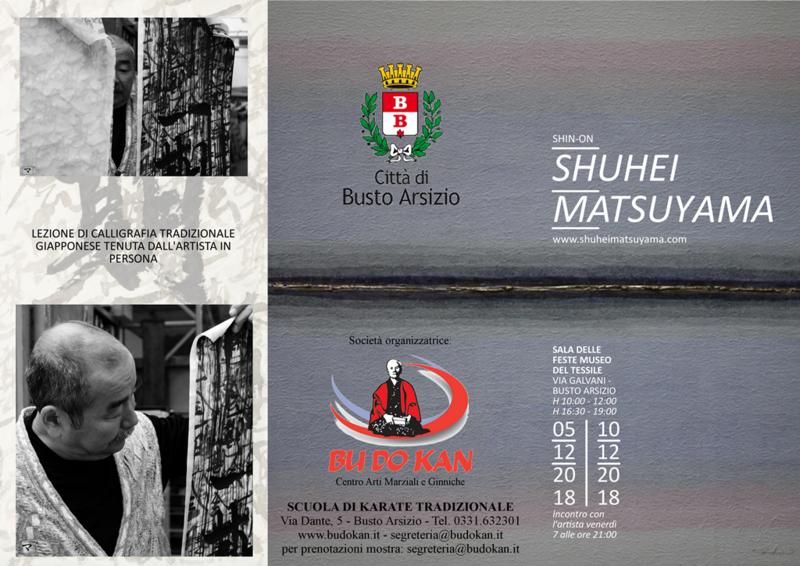 L'ARTISTA PARTIRA' DAL KARATE TRADIZIONALE, DISCIPLINA CHE PRATICA DA ANNI, ESEGUENDO PERFORMANCE DI KATA ( FORMA), PER APPRODARE ALLA CALLIGRAFIA GIAPPONESE PER CONCLUDERE INFINE CON LA CERIMONIA DEL TE', FONDENDO INSIEME ALCUNI ELEMENTI CARATTERISTICI DELLA CULTURA GIAPPONESE. 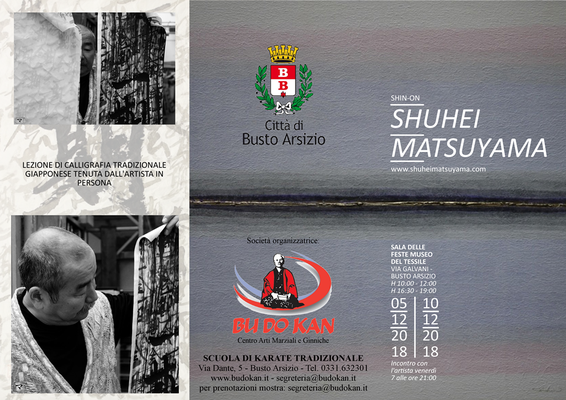 UNA FUSIONE DI ARTE, CULTURA, TRADIZIONE E MARZIALITÀ DAVVERO UNICA. LA PRESENTAZIONE E' APERTA A TUTTI GLI INTERESSATI.